BuzzFeed News warned in a tweet on Wednesday that a viral image of an Iranian woman defiantly removing her headscarf is "old," despite being taken only a week earlier. "People are using an old image of a woman without a headscarf to illustrate the Iran protests," the tweet read. "As protests against the government in Iran have gathered steam, one image, showing a woman waving a white headscarf on a busy road, has been widely shared online," BuzzFeed‘s Rose Troup Buchanan wrote in an article published Wednesday. "But the image, a still from a video, was first posted online last week—and she had nothing to do with the current protests sweeping Iran." The image actually came from a video of the group My Stealthy Freedom protesting women being forced to wear the hijab in public in Tehran last Wednesday. 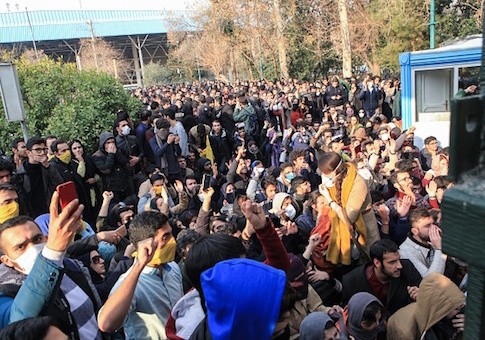 The nationwide protests against the Iranian government began only a day later, last Thursday. BuzzFeed wrote that "right-wing personalities" used the image of the women's protest "to further their own agenda," but none of the tweets highlighted by BuzzFeed actually claimed the image was from the larger anti-government demonstrations. Iranian women vs Swedish "feminist" ministers in Iran. The women of Iran are risking their lives fighting for freedom meanwhile Western Swedish women ministers are bowing to oppression. This picture sums up perfectly why Sweden is in such a bad state. This entry was posted in National Security and tagged Buzzfeed, Iran, Protests. Bookmark the permalink.